Despite being the titular bad guy in the newest Batman video game, the Arkham Knight was underdeveloped as a major villain. It’s a good thing that a new comic series is convincingly demonstrating how someone very close to the Dark Knight wound up wanting to kill him. 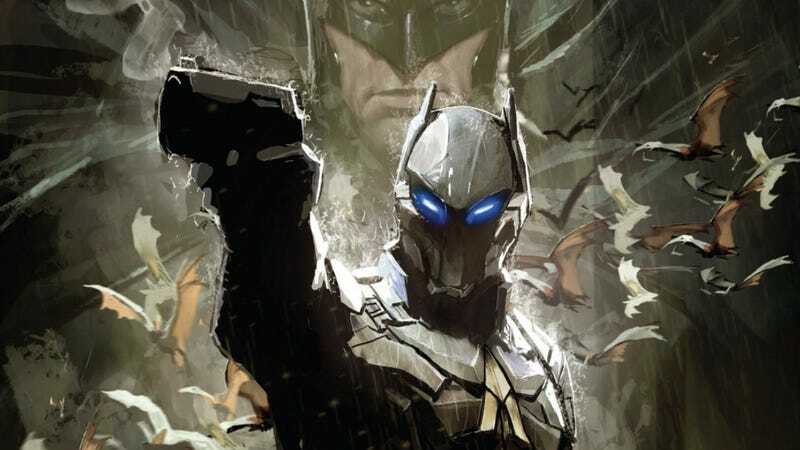 Arkham Knight: Genesis is the second comics project tethered to June’s big Batman game. The first one, called Batman: Arkham Knight series has been mediocre, showing the pointy-eared armored villain darting in and out of the fringes of Batman’s life before the events of the game. Genesis shares the same writer—longtime Bat-scribe writer Peter Tomasi—as that series but is the better comic. It shows what made the second Robin turn into the Arkham Knight. One of the best things about the Batman Arkham games is how Rocksteady remixes seven decades of Batman lore. It’s nice to see Tomasi make changes to Jason Todd’s origin story. The character still starts off on the wrong side of the law., As befits the events in the Arkham-verse, though, he meets the Joker even before he becomes Robin. After Jason saves Batman, he receives a Wayne Foundation scholarship and a tryout for a very different kind of afterschool job. Today’s issue #2 of Arkham Knight: Genesis features Deathstroke, as Jason thinks back about his past life with Batman. Tomasi’s always excelled at writing the love and dysfunction that’s part of the Bat-family. The best part of Arkham Knight: Genesis has been getting inside Jason Todd’s head and hearing what he was pining away for. He thought he’d become a surrogate son, a true crimefighting partner, never realizing how his own flaws prevented that from happening. Because they’re compressing and re-purposing storylines and characterization in the service of incentivizing gameplay, the Arkham-verse games sketch out a different vision of Batman. He talks more, seems like less of the all-knowing master strategist seen in the comics and comes closer to death more often. That has to happen so Jason Todd can save his life in crucial drama-making moments. Jason is hard to sympathize with, but his turn still feels tragic. Tie-in comics based on video games usually stink, but, so far, the character work in this series is exactly what I wanted but didn’t get in the Arkham Knight game. Jason Todd’s always been a fascinatingly complicated member of the Bat-family, and it’s good to finally get a strong story based on the video-game version of the Dark Knight’s prodigal son.